The North End Pavilion was engulfed in flames for hours Saturday. 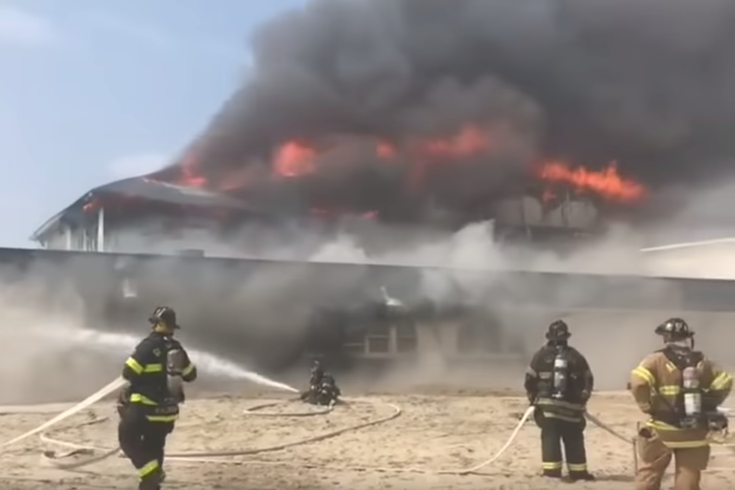 A five-alarm fire engulfed the North End Pavilion in Ocean Grove, New Jersey, Saturday and left the legendary Jersey Shore building all but destroyed. Emergency firefighters and equipment were called on from across the state to help fight the blaze, which was first reported around 11:30 a.m. and burned late into the evening, according to the Asbury Park Press. The Pavilion, a half-century-old building, was home to a handful of restaurants and businesses, including the Dunes Café. The damage to the Pavilion and surrounding boardwalk area is likely “millions of dollars”, according to the Asbury Park Press. A cause of the fire is not yet known.